Mini Broccoli Quiches – Create, Make & Bake! 6th October 2017 24th April 2018 - by Abbie - 4 Comments. I’ve made quiches before but I think these ones were nicer, it also has an odd way to make pastry. Usually pastry would need to be quite cold to work, but this recipe wants to BOIL the water and butter! Nanny likes this pastry though, so I suppose its alright. Makes about 20 – 24. 1. In a small saucepan, boil the water and butter together. but stop if it stares the froth, like mine did. Leave it to cool a bit, but not too much (otherwise it will probably go lumpy). 3. Knead the dough on a floured surface for no more than a couple of minutes, leave it to rest. Roll it out to about 1/2cm thick, cut out circles with a fluted (sorta bumpy) cutter and place into the tray, prick the bases and set aside. 4. Mix together all the ingredients for the filling, being careful not to mix it too much as the lumps of soft cheese are really nice in the finished product. Spoon the mixture into the pastry cases and bake for 25 minutes or until the pastry is semi-hard and the filling looks cooked (this pastry doesn’t really brown). Enjoy! Thanks for sharing your recipe! I have actually never made Quiche before, but have had it. It doesn’t look too hard though, so may have to try making some sometime! These sound so easy and tasty! I would love to make them ahead and freeze them for mornings I need a quick breakfast! 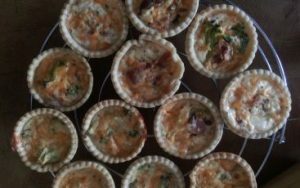 Pingback: Tortilla Quiche – Create, Make & Bake!